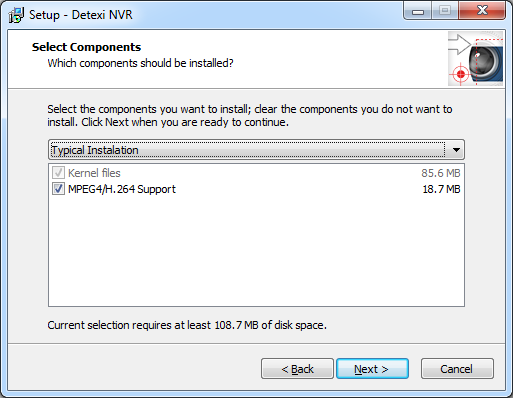 If this is the first time you are installing DETEXI, you want to download the full package — NVR Installation — which contains all the files for DETEXI including: NVR Server, NVR Control Center GUI, Local and Remote Client, Archive Viewer, and other modules and utilities (at least 90.2 MB of free disk space is required). To get the DETEXI full package, first, communicate an authorized dealer in your area. You will be provided a link for downloading the latest release of DETEXI. Always use the latest version to ensure that your installation has the latest functionality and improvements. 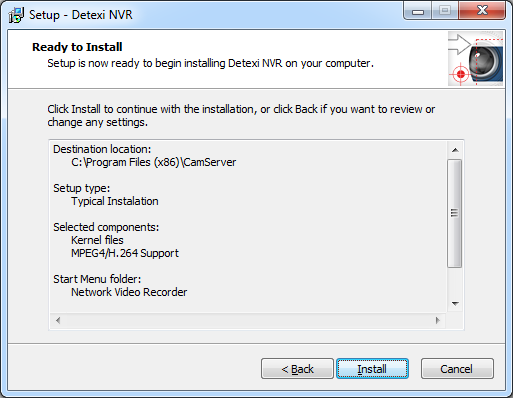 If the NVR has been already installed on another computer you may choose to install only DETEXI Remote Client. Remote Client Installation package can be downloaded from the DETEXI website (Product Overview) and installed on the unlimited number of PCs for free. Install DETEXI software on a dedicated computer. 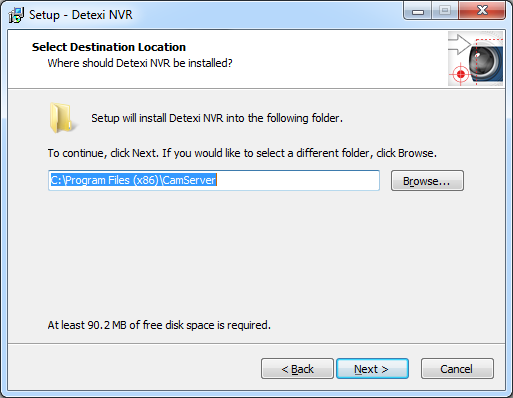 Download the latest release of DETEXI NVR (Client). Uncompress the DETEXI files and copy them to a directory of your choice. Select the preferred language to setup. Click your way through the Setup Wizard. Firewall — DETEXI NVR Server accepts incoming network requests from DETEXI Clients that can be located outside of your local network. If your computer has a firewall installed it must be configured to allow incoming network requests. 2. Read the license agreement information. Select I accept the agreement and click Next. 3. Select DETEXI NVR location and click Next. 4. Select Components and click Next. 5. 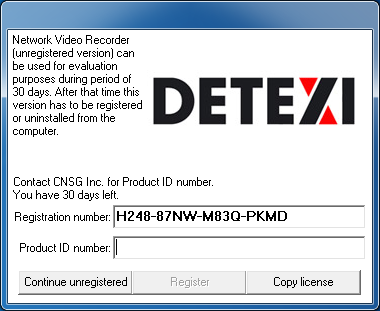 If the DETEXI NVR Server will be used for recording video information, just click Next. If you are going to use external storage — specify, first, User Account to start NVR services. 6. Create Start Menu folder for the program’s shortcuts and click Next. 7. Check Create Desktop Icons checkbox and click Next. 8. Click Install to continue with the installation, or click Back if you want to review /change the settings. 9. Wait until setup is complete. This can take several minutes. 10. Click Finish to exit Setup. Cameras and licenses can be added one by one and the system hardware and/or software can be expanded to meet increased performance requirements. 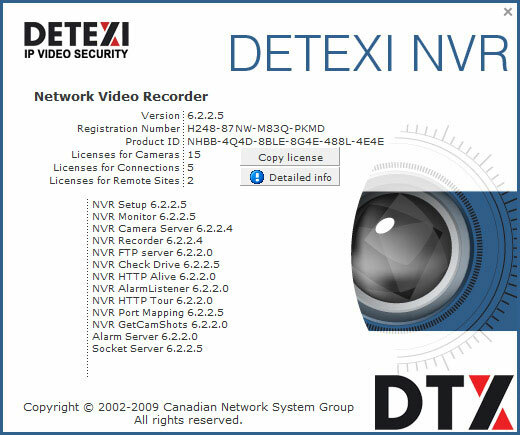 The DETEXI NVR will limit the number of video inputs (network cameras or analogue cameras connected to video encoders) and the number of simultaneous Remote Client connections based on the NVR’s license. 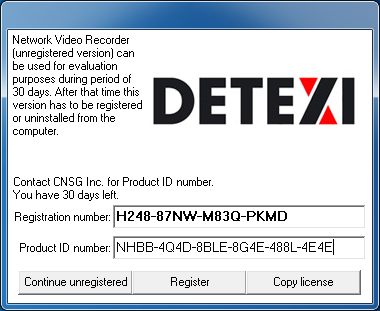 To purchase the DETEXI Video Management System software you should acquire a base license for a defined number of video inputs (network cameras or analogue cameras connected to video encoders). 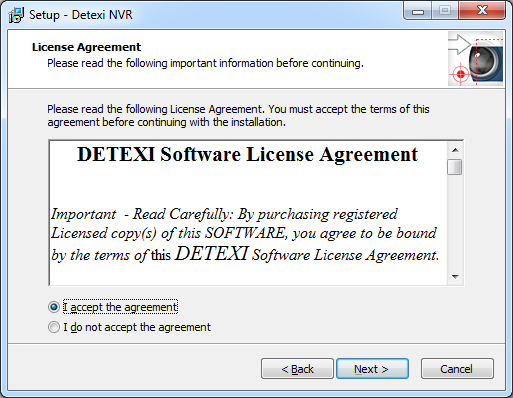 A base license includes DETEXI NVR and 1 Remote DETEXI Client simultaneous connection. The first license installed on the system must be a base license. Thereafter, customers may purchase additional upgrade licenses to upgrade the number of video inputs and/or simultaneous connections. Purchase of 1 or 2-year support license is required for all DETEXI software products. It will grant you technical telephone support (8:00 am - 5:00 pm ET) and software upgrades as needed for a defined period of time. UCIT Online recommends that support licenses be constantly renewed for continuous technical support and future software upgrades. With the DETEXI software demo version and the DETEXI Remote Client freeware UCIT Online — the software developer does not offer any product support. In order to manage a distributed NVR network (domain) a child-domain base license should be purchased. Thus, it becomes possible to control remotely from the DETEXI NVR Domain Controller the group of several NVRs that are logically attached to it. 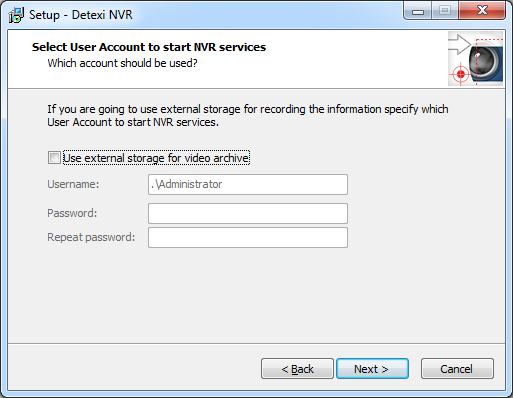 The license includes the DETEXI NVR Domain Controller and defines a number of child NVRs in the NVR network. 5 Remote DETEXI Client simultaneous connections are also included. To add defined number of child NVRs to the multi-site NVR network purchase child upgrade license. If 5 NVRs logically attached to the main NVR (NVR Domain Controller) are required you’ll need to buy 5-child-domain base license. In order to get the DETEXI System modules that integrate different mechanical and electronic security solutions such as access control devices, building management systems and industrial control systems an appropriate license should be purchased. 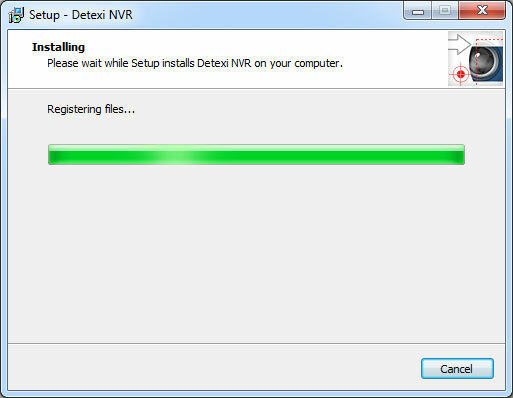 When the DETEXI NVR is first installed, it will be in demo mode for 30 days. Within the 30 days of demo mode Continue Unregistered button is active. 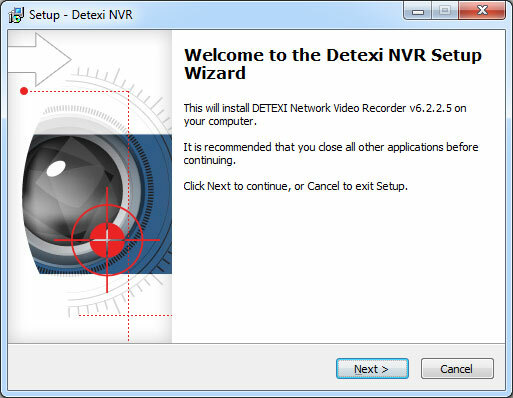 If you are currently running the DETEXI NVR demo version and wish to switch to the full version of the NVR, you have to register the software. To register the DETEXI NVR, first, communicate the Registration Number to your DETEXI dealer. You will be provided a Product ID and License Key file. The License Key can be used for only one current installation. Once registered it cannot be used again. The License Key is your proof of purchase. 1. Place the License Key file to a directory of your choice. 2. 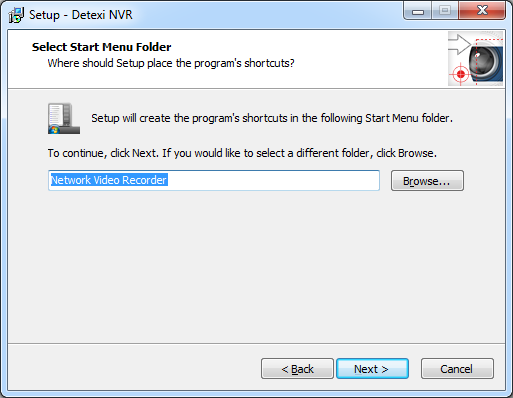 Launch the NVR Control Center using the shortcut on the desktop. If it is already running, close and launch it again. 3. Click Copy License button. 4. 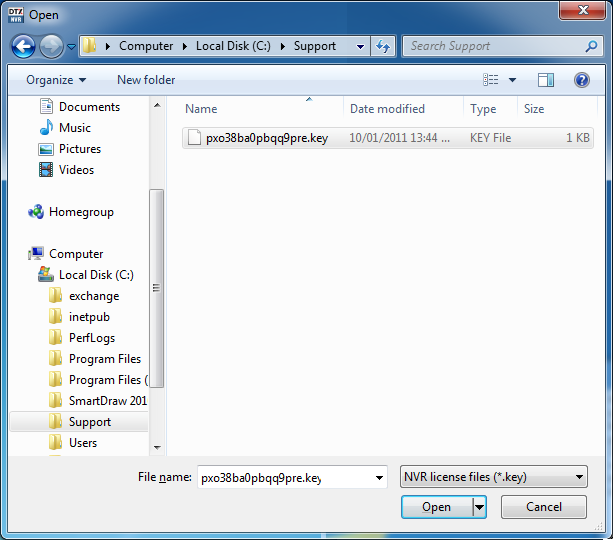 Open provided License Key file. 5. Copy provided Product ID in the appropriate field — the Register button will become active. Press the button to complete registration. 1. 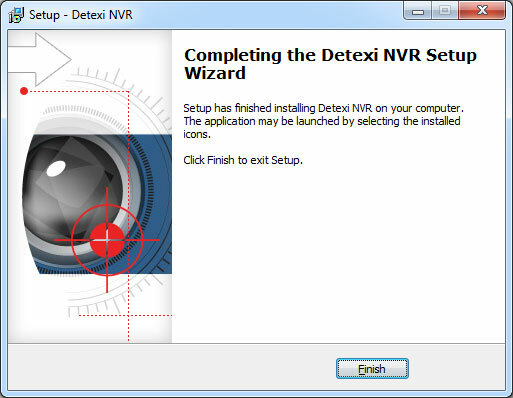 To get the software registration and license information — in the NVR Control Center click on the Advanced tag and press About button, the DETEXI NVR About splash screen appears. 2. Click Copy License button to copy the License Key file. 3. For more information click Detailed Info button.